Three other members of NWA’s staff and I were in Puerto Rico last week to meet with, hear from, and share information with staff of Puerto Rico WIC. 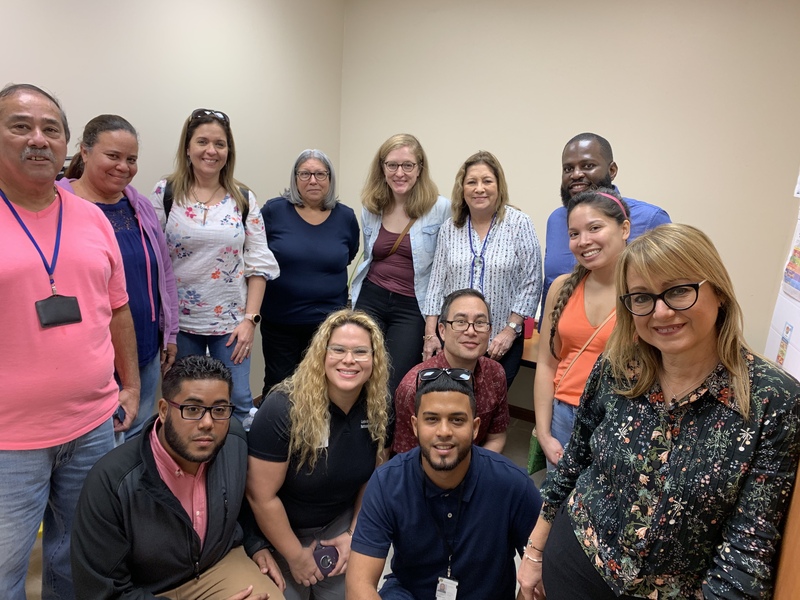 On Wednesday, we were with about 50 WIC staff members, most of whom manage WIC clinics in three of the six regions of Puerto Rico WIC that are closest to San Juan, Puerto Rico’s capital. On Friday, we were with a similar-sized group of staff from the three other regions closer to Ponce, a large city on the southern coast of Puerto Rico. These two gatherings in Puerto Rico are part of a series of meetings that NWA staff in Washington, DC, are holding with state WIC agencies in different parts of the US and its territories. These convenings started last fall and will continue through this spring. This week, our group is visiting the US Virgin Islands while we’re in the Caribbean to try to raise the profile of WIC among community health partners there. These convenings are funded by a grant to NWA from the David and Lucile Packard Foundation and can also be described as listening sessions. NWA staff want to hear from WIC staff about their everyday work and challenges they face and carry what we hear back to decision makers back in Washington, DC, and as we work on such issues as maternal and infant mortality. The agendas at our gatherings in San Juan and Ponce were packed with many presentations – sharing information with Puerto Rico WIC staff from our work in NWA in Washington, DC - and hearing about their situation. One major topic that was discussed was the aftermath of Hurricane Maria – what happened to WIC services and clinics in the time immediately after the hurricane as well as where Puerto Rico WIC stands today, a year and a half after the hurricane hit. Puerto Rico WIC staff shared stories about the resilience of staff in their clinics in the days and weeks following the hurricane. Clinic managers described the dedication of staff who reported to work despite transportation not being available. One clinic staffer spoke at the Ponce gathering about how her clinic was near the water, and so the wind from the hurricane caused a lot of damage to the clinic’s roof. The clinic also had no windows, so mold and mildew was a major problem. The mayor of her town provided space in his house for a few months when the clinic re-opened. Most of the clinics that had suffered this type of physical damage are open and operating again today. The challenge clinics and the central office of Puerto Rico WIC are facing these days is government processes. There are slow procedures for securing office equipment like printers to print benefit checks for WIC participants. The government of Puerto Rico is also bankrupt, so there is a fiscal crisis that complicates the funding situation for WIC, which is operated by the territory’s Department of Health. Despite these challenges, Puerto Rico WIC staff were very vocal about their dedication and commitment to WIC and serving WIC participants. NWA staff were warmly welcomed to the island and treated hospitably. We observed that Puerto Ricans are generally expressive and social. People – family, friends, and coworkers – are important to them, and so are the people – WIC participants – they serve in their work. Pictured is NWA staff with WIC staff and others on the island of Vieques.